Valentine’s Day is around the corner. I can already hear the collective groan from the men. I know how hard it is on you. I do. It’s just after January, the never-ending 60 day month that constantly reminds you of the poor financial decisions you made in December. Finally it’s over. February is here, bringing so much relief from the stress of January. An oasis in the desert. And now your girl wants flowers, chocolate and a fancy dinner in a fancy restaurant! I know you mean well but sometimes you forget. I understand. The day gets so busy and you don’t realize how much you’ve messed up until you get home and get that sour look from your wife. So today I’m going to cut you some slack, give you a break. Today, let me speak to the ladies. My name is Wanjiru Kihusa. I’m a born again Christian, a writer and a loved wife. I have been married for a while and contrary to what the media (read Classic 105) is telling you, marriage is amazing. I am genuinely happy, I love my man. I’m not persevering in my relationship. I love being married. Today I want to talk to all the ladies out there who have a great man but won’t see it. You’re man provides for you, pays bills on time. He’s hard-working and responsible. He’s a great father and partner. He may not take you out all the time, but every once in a while, he does. So what if he forgets Valentine’s Day? C’mon! I know you feel let down especially after Lucy your colleague got flowers sent to the office. Her man is so awesome, if only your guy wasn’t so clueless. 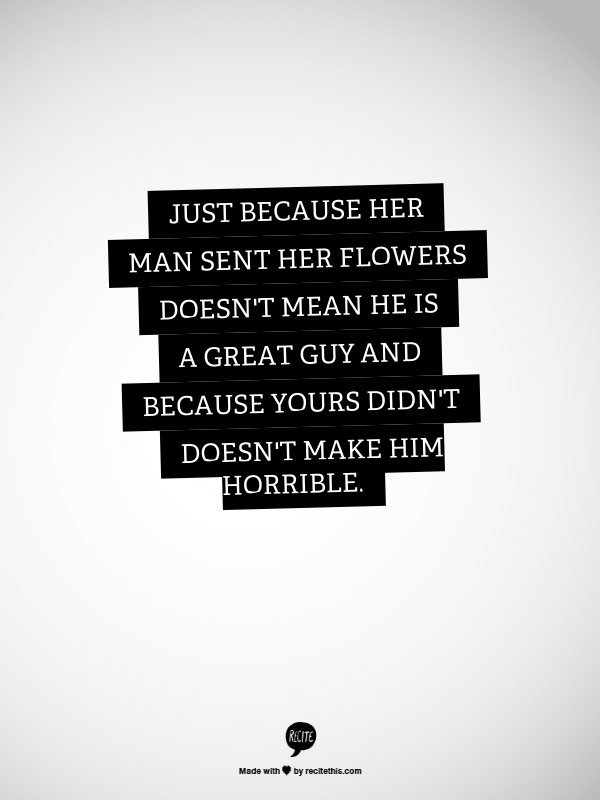 Just because her man sent her flowers doesn’t mean he is a great guy and because yours didn’t doesn’t make him horrible. Hear me out. I have been writing and speaking to people about relationships for a while now and I can tell you there some terrible men out there. I have read and heard such ugly stories – stories I wished were not true. There are other women who have it bad. There are men who don’t care to provide. They cheat and some even beat their wives. I have heard stories of men who have affairs and don’t even have the decency to hide or apologize when caught. All I’m trying to do is give you some perspective. I want to show you that you have a good guy and I want you to appreciate him this Valentine’s. Forget how he usually leaves the toilet seat up or how he snores. 🙂 Do something nice for him. So today I want you to give you a few ideas on how you can appreciate him. Here are a couple of them –most of them are in the marriage context because that’s where I am but I’m sure you can twist them a bit and make them work. 1. Take him some place nice. – It doesn’t have to cost and an arm and a leg. Go some place with good food and relatively good ambience – somewhere you don’t have to shout to be heard. 🙂 Make sure you take care of the bill otherwise it’ll just be him taking you out. 2. Make him a nice dinner. (If you’re not married, make him a nice lunch.) – In case you can’t go out, fix him a nice meal. Don’t do the usual rice and beans. 🙂 Look up a nice recipe on www.pendolamama.com or www.leotunapika.com. They have great recipes with readily available ingredients. For those of us who are married, pull all the stops, great music, candles and the best china. 3. Reasons why I love you – Write a list of all his great qualities, the things you love about him. If he’s hard-working and responsible, say it. Write as many as you can and give him the list during dinner or lunch. Resist the urge to add a column of things you feel he should work on. 4. This is strictly for the married ladies – No headache tonight! This post was written by one of our awesome guests. Wageni mwakaribishwa.